Angela Spahr, ’13, recently participated in her second medical mission to Haiti. 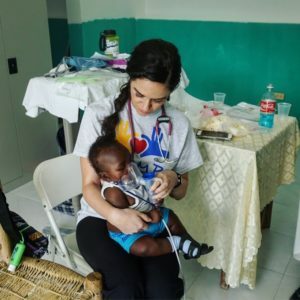 She traveled with a healthcare team as part of CHAMPS: Connecting Hope and Medicine to People in Haiti. They create rural clinics and provide medical care to Haitians in Croix de Bouquet and Mirabalais. She personally treated 370 Haitians and hiked into a village that has never received formal medical care before. The team was paired with a Haitian doctor and a Haitian dentist who pulled out 300 teeth during their visits. Angela said it was an amazing experience and loves being able to apply her skills as a nurse to so many in need.